The following drawing is for the SPI side of things, but I wonder if fiddling with the I2C CLK would lead to same behavior ? 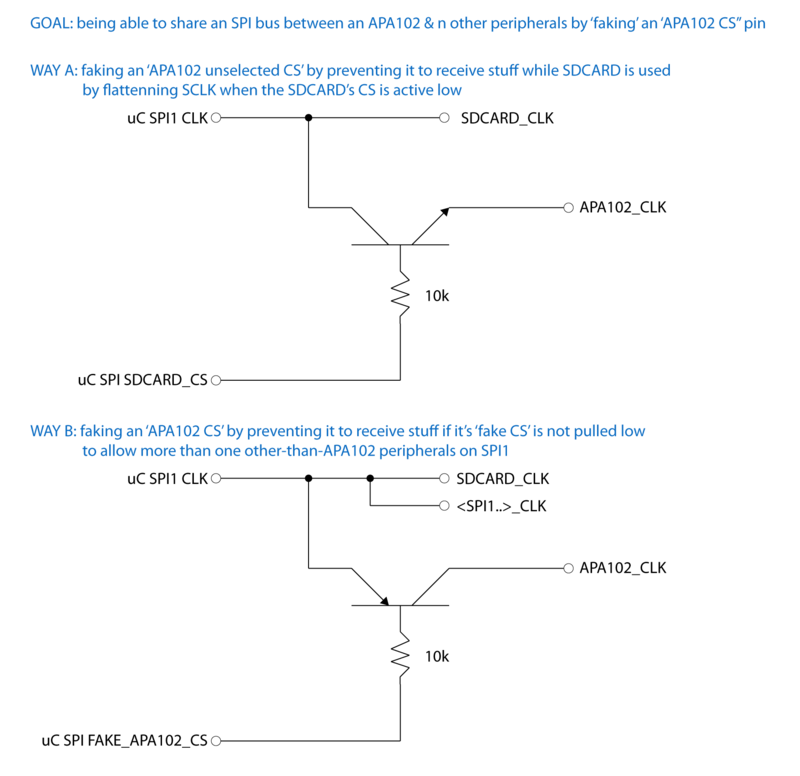 Yes, you could probably do something like that - but how about dynamically swapping SPI/I2C to some of the other pins the device can output, or just using software SPI/I2C? Software SPI particularly is actually quite fast. If I understand you correctly, your suggestions ( software spi or pin swapping ) won't help reduce the number of pins used, right ? Or by 'pins swapping', do you mean declaring software or hardware spi/i2c but with a different pin for the clock signal so as to only have the device(s) with this clock pin connected to actually received data ? 2: I'm not sure wiring a transistor in series with a 10k resistor with Collector on +3.3V & Emitter on A0 'll effectively give me ( for correct resistor value for 1 ) sort of an 'analogWatch' via 2 pins ? I guess I'll have to be more cautious on the length of the wires used between uC & the resistors to have something ~constant in this circuit, hoping the erroneous readings come from that .. I hadn't really considered that, but yes, that would work great. For the SD card you have a chip select pin so that might give you something you can use as well? Sounds like a good plan with the resistors + analog. 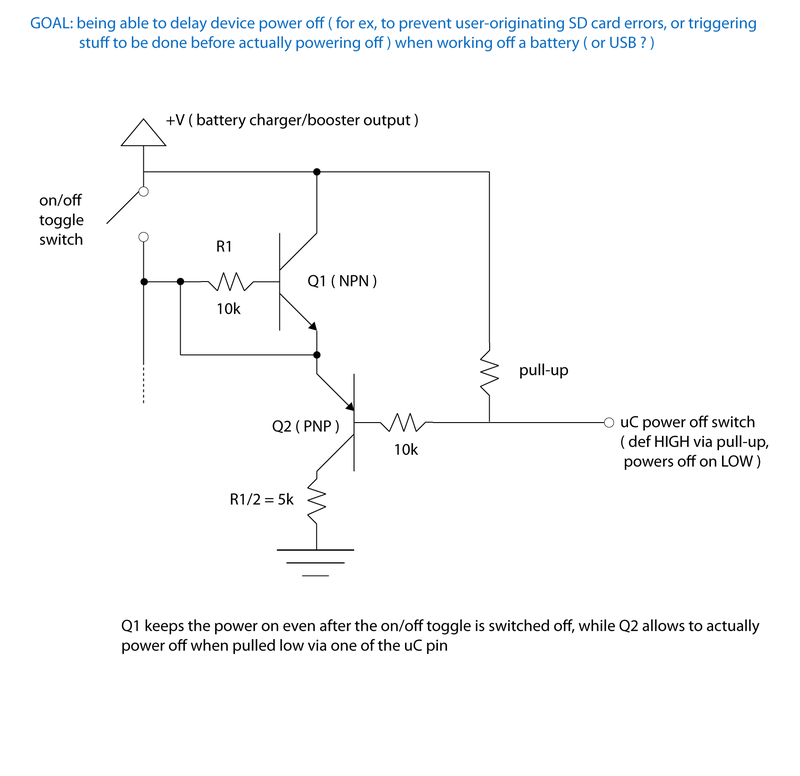 I'd say don't use an internal pulldown as it won't work with analogRead (iirc), and make sure that when pressed the voltage changes from 0v to above 1.7v to make sure you get a reliable setWatch. Also remember that to get analogRead to work you may need to set the mode to analog - or just use pinMode(A0) to set the mode back to auto before using analogRead. 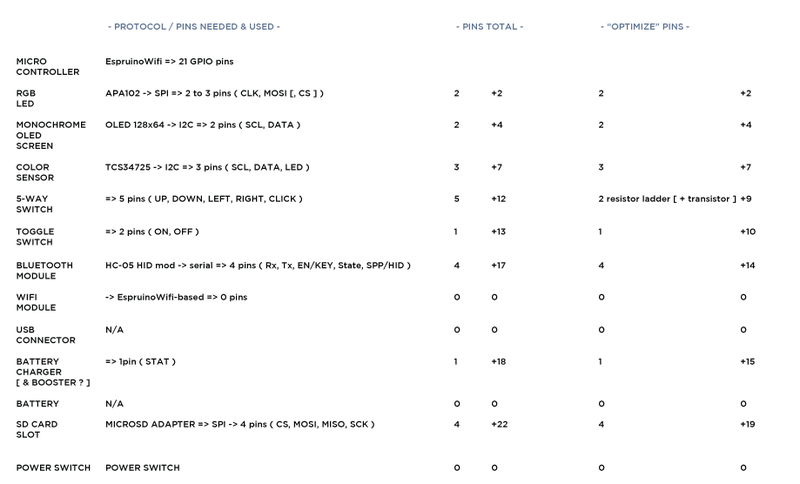 And to get reliable analog readings you may want a (small) capacitor between GND and A0. You may also be able to put the battery charge status and/or toggle switch on exactly the same A0 pin as well. If your 5 voltages are 2v,2.25v,2.5v,2.75v and 3v then if the toggle switch varied the voltage by 0.05v you could detect that. Onto the "2pins analog setWatch" hack, I had some success with a quite simple circuit in which the A0 pin ( on which a digital setWatch() is set ) is connected directly to the A1 pin, used as analog input. I didn't try ( yet ? ) adding a "small" ( 1 uF ? ) cap - how would it "smooth" the result ? put the battery charge status and/or toggle switch on exactly the same A0 pin as well. If your 5 voltages are 2v,2.25v,2.5v,2.75v and 3v then if the toggle switch varied the voltage by 0.05v you could detect that. nb: I'm not quite sure of the followings ( gotten using successive tries on tinkercad .. ), but these may be the resistor values you had in mind to produe your proposed voltages ? pinMode(A1, "analog"); // has external 10k pulldown resistor -> yup, I am DUMB ! //else if(buttonAnalogVal > 1.70) console.log('btn6'); // N/A for 5-way switch ..
adding a "small" ( 1 uF ? ) cap - how would it "smooth" the result ? The ADC in the chip expects quite a low resistance to get accurate results (since otherwise the act of switching in the ADC itself would cause the voltage to drop) - so the capacitor gives you that low resistance :) It may not actually be an issue here at all - it's usually for 100k+, and you're not looking to get loads of accuracy (I guess even just 6 bits would do you pretty well). Does it matter about voltage drop across D1? 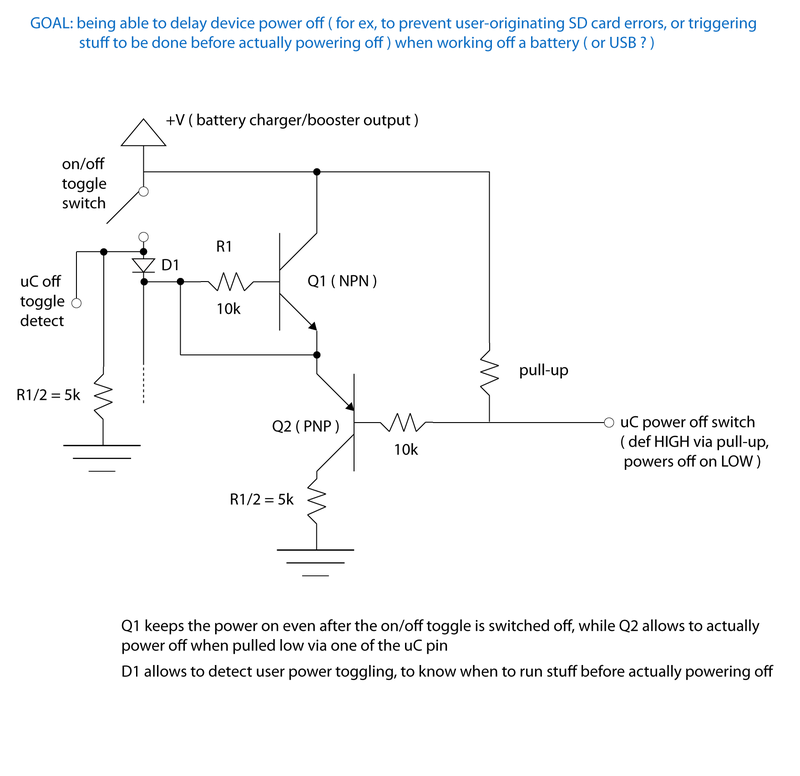 As soon as the microcontroller is powered on it can turn Q1 on, which will remove the voltage drop anyway? But I'd just use a schottky diode? About 0.3v voltage drop?